To conclude our first month and introduction to luxury at ESSEC, my classmates and I participated in Le Savior Faire d’Excellence, which was a series of classes that gave us insight into various areas of luxury. My favorite class in this series was the Gemology class. I had never studied the various gemstones so I did not know what to expect when we walked into the classroom. I was extremely impressed by our Professor, Mr. Mehdi Saadian, who is the school director at GIA’s (Gemological Institute of America) London campus. His passion for the science of gemology was contagious and I was eager to soak in as much of his knowledge as I could during his seminars. Over the course of three seminars, we explored the various characteristics and topics related to diamonds, pearls, and colored stones. Each category of gemstones has its own unique features and factors that can be used to analyze to grade the quality and rarity of the stones. Diamonds are the most commonly purchased gemstone and we spent time detailing the features of these beautiful gemstones, including the 4Cs of diamond quality. The 4Cs of diamond quality was created by the GIA to provide an international language on how to compare and evaluate diamonds on four dimensions: Color, Clarity, Cut, and Carat Weight. We also learned how diamonds are naturally formed and the areas with the largest reserves of diamonds. Our next seminar covered pearls and how these symbolic gems have transcended time. Wendiscussed the history of the popularity of these organic gems, starting with the Polynesian legend of pearls being gifts from the gods, with pearls falling from rainbows into the sea. Pearls gained popularity as they became symbols of wealth and power, and today, pearls are very much integrated with fashion. Mr. Saadian taught us about the characteristics of various types of pearls including Akoya, South Sea, Tahitian, and Conch pearls, just to name a few. We also learned about the GIA 7 Pearl Value Factors™: size, shape, color, luster, surface quality, nacre thickness, and matching. Our final seminar was dedicated to colored stones. During this seminar, we discussed the common attributes of the various types of these stunningly beautiful gemstones and how to differentiate between these stones. We also learned about the different factors used to grade quality and rarity. We not only talked about sapphires, rubies, and emeralds, which are historically known as the most precious of the colored stones, but also about other colored stones including opals, topaz, and tanzanite. This short but fascinating seminar left me eager to learn more about gemology and also very much excited to learn more about the jewelry sector of the luxury industry and how these precious gemstones are integrated into creating beautiful pieces of art. 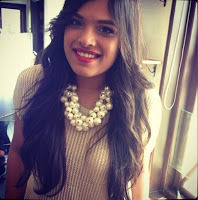 I started my career as a Fashion Stylist at ELLE India. As a young girl I dreamt of being a stylist, so when I got the opportunity to intern at ELLE India I grabbed it. After months of toiling as an assistant, making sample call in’s, multiple coffee runs and steaming clothes, I got offered a permanent position. I worked my way up the ladder and ended up at the position of Senior Stylist. I had the privilege to attend national and international fashion weeks, meet the fashion influencers of the country, create fashion stories, travel to the most exquisite locations for shoots and interview the most intriguing talent in the country. After 3 years I knew there was more I could achieve. Along with an amazing Founder and a team of young creative women we started a company called The Label Corp. This was a boutique private label composing of three website that retailed online; www.thehomelabel.com offering home accessories www.theclosetlabel.com for fashion apparel and www.thetrunklabel.com for fashion accessories. Each of these labels was curated by a celebrity tastemaker from India. Since it was a start up I had the challenge of handling myriad responsibilities, starting off with product development, then moving on to content and communication and finally managing alliances and offline marketing activities. The experience I received with the hands on approach that a start up requires and seeing the company grow from seed to getting funded by venture capitalists was a once in a lifetime opportunity. This time in my career helped me get a good perspective on being an entrepreneur and all that goes with it. I have always felt undying passion for the luxury industry. This love began when I worked at ELLE magazine and got the opportunity to deal with the brand managers of the top luxury brands in the country. I was invited to all the collection previews and sent to interview international brands that came into India. My love for this industry grew each time we had to style a shoot; we would call in for the latest pieces, off the runway of these luxury brands. Being able to touch and feel the products and finally styling them together to create a fashion story that appeals to our Indian reader gave me a rush and I knew this was my calling. When I worked at The Label Corp, I had this urge to turn The Label Corp into a luxury label and my daydreams saw no bounds. After speaking to some very helpful ESSEC alumni I knew I had to take the plunge. Doing an MBA in International Luxury Brand Management was the only next step and ESSEC being the top most school in the industry was an obvious choice. Besides where can you learn best about luxury but France?! Since I haven’t directly worked in the luxury industry I am aiming to learn everything I can about this world from the best faculty one can ask for, most of who have had years of experience being top management in the industry. I believe luxury is driven by excitement, passion and creativity. Learning from classmates who have such diverse cultural and professional backgrounds is something I am looking forward to. Each one of us has something unique to bring to the table and that’s what makes this year so exciting for me. With my experience in fashion I always believed I would end up working in fashion or accessories. But as I learn more about beauty, my love for this industry grows. I am open to falling in love with different categories in the luxury world and only time will tell what lies ahead for me. Meeting the industry insiders from the top brands and listening to them enlighten us about the different opportunities available in the luxury world is the perfect guidance once needs. Since I have a background in the digital space I would like to explore that aspect of the luxury world as well. It is a brilliant program and the best one in this field. If you have a true passion for luxury your job is half done. It is a small class and only the best of the best get in. The MBA in International Luxury Brand Management is meant for individuals coming from interesting backgrounds that have one thing in common; a lust for luxury! I am two weeks into the coarse and the workload is piling up, so note it’s a very serious MBA. But through this time you will get to meet, experience and learn about the most exquisite things about luxury and I guarantee it will be the best year of your life. It's been merely two weeks since we've joined our new family at ESSEC, time feels like it's passing so quickly but the days are definitely stretched longer! We have so far survived the initial shock of transitioning back to school, being loaded with assignments and group works, figuring out how to eat around school, and getting to know our class of 44 better and retaining everyone's names. We haven’t been at ESSEC long but we were fortunate enough to receive an email invitation to the round table event of MBA in International Luxury Brand Management. The theme for the afternoon was "The challenges: from the past to the future in the luxury industry". This was an exciting opportunity to celebrate the 20th Anniversary of our program, and also to hear the latest views from the invited guest speakers, plus for current students, alumnus, guest speakers to mix and mingle. For any luxury fashion fiend, this was a fascinating line-up and the talk did not disappoint; the panel exchanged their thoughts on the future of managing creativity and savoir faire, and the importance of sustainability in this area. It is now that we need to build the legacy of tomorrow, and for luxury it is no different. There was also an interesting and heated debate regarding the news of the Hermès x Apple watch and how this redefined the meaning of luxury and craft (or not). This session was followed by a short coffee break, where in between nibbles of rum cannelés I managed to spot a few students from the year before whom I knew, and catch up on their job offers and coming plans. It was wonderful to know that many of them have already found positions and I congratulated them on their hard work and success. They had a discussion on the relationship and challenges of digital and e-commerce in the luxury industry, and the importance of the human touch presence in this industry. The greatest potentials of digital may not actually lie in e-commerce, but perhaps more in how digital can be harnessed to give additional services and enhance customer experiences. As the afternoon wrapped up, the students had some time to exchange Q&A with guest speakers. I looked around the room and found myself surrounded by people from all different sectors, each one as talented if not more than the next, and the knowledge that I have so much to learn from each individual gave me the inspiration and momentum I've been looking for. It's going to be a sleepless and exciting year. We the class of 2016 have just finished off our first month of classes – and what a month it’s been! We’ve arrived, started classes, finished classes, completed challenging assignments, attended the 20th anniversary round tables (phew! What a busy month) and to top it all off we’ve even been on a field trip to Ecole Lesage. You may already be familiar with Lesage, but just to cover my basis…Lesage is an embroidery house here in France that embroiders for many of the top fashion houses and couture collections. Now back to our field trip - the early morning start couldn’t stop the excitement and buzz that surrounded the day to come. We arrived at Ecole Lesage in time for our 9:00 a.m. presentation, we were warmly greeted and welcomed into a very modern space that was decorated with samples from various projects that Lesage has worked on. The presentation was engaging and a lot of information was shared. We were treated to an oral history of Lesage, fashion and the different types of ateliers. With everyone having a passion for luxury (why else would we be in the program!?) we were very eager to learn and probably asked too many questions for our own good but they were happy to respond to all of them. Once that was wrapped up, we were whisked away by a bus to visit the actual workshop, where the true meaning of savoir-faire was waiting for us. From the moment we entered the atelier we were surrounded by art and beauty. We were very privileged to see the embroidery and craftsmanship that was in the middle of production – and because we were there just before Paris Fashion Week we had the opportunity to feast our eyes on some exciting things (but no sneak peek here – we gave our word!) What I can say is that it was all exquisite, the attention and care that is put into each stitch is overwhelming and we all appreciated the beauty even more now! After we had the grand tour we were taken back to the Ecole, where we all had the opportunity to try our own hand at embroidery. After a painstaking 3 hours we all had our own hand made masterpiece and while I’m sure the professionals could have completed what we did in half the time, we were all very proud of what we accomplished. All this to say, that seeing savoir-faire in action gives you a whole new appreciation for the quality and care that goes into luxury products .If this is how we ended month 1…bring on the next!